Oops, I emailed my private feed link to everyone! If you accidentally share your personal feed link with others, you can go to your profile page and revoke your key for the blog in question. 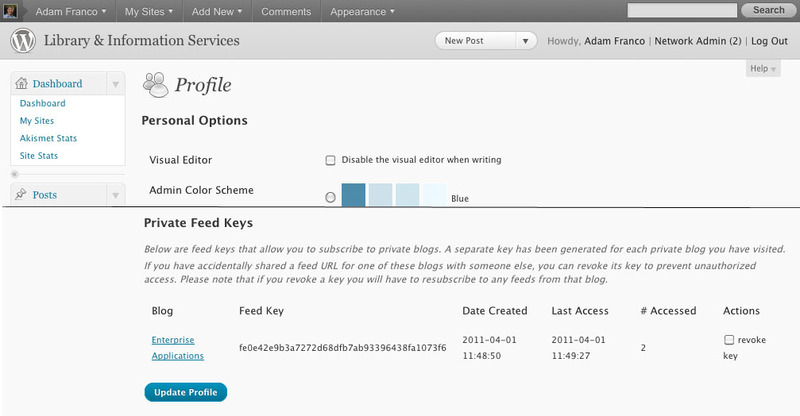 Note that you will need to resubscribe to the feeds yourself if you revoke a key. If someone finds out my key, can they use it to access my other sites? No, keys are per-user and per-site. I removed a user from my private site, will they still see updates? No, the feed keys just authenticate the user, they still are checked against the subscriber list before showing them content. Will my feed key let me edit without logging in? No, the key only grants access to feeds, nothing more.